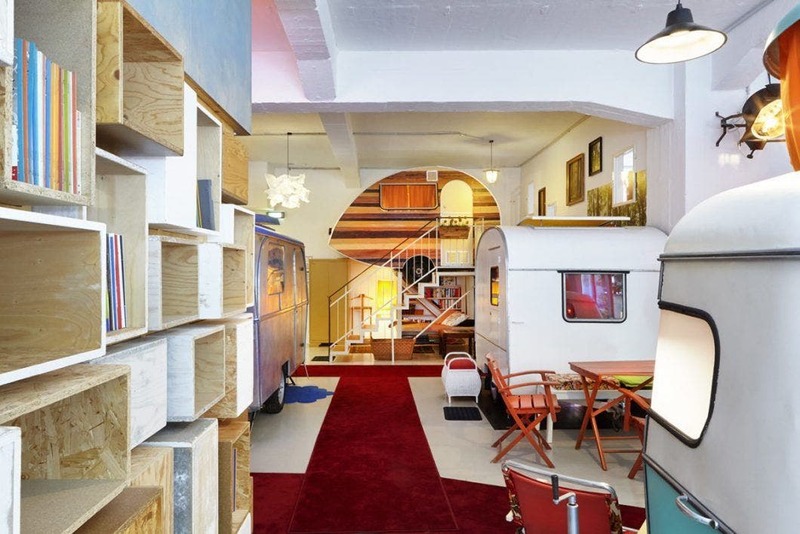 Placing tiny houses and campers inside an unused, yet protected, space such as a parking garage or warehouse is not a new idea . 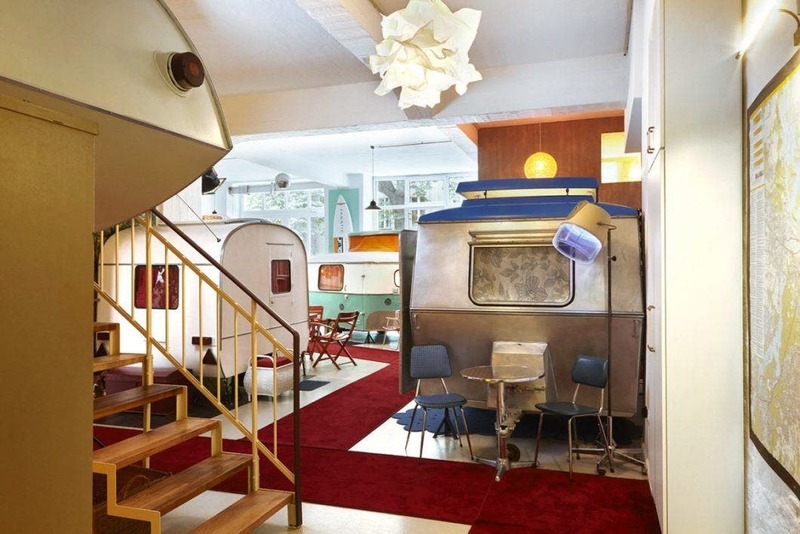 However, the Hüttenpalast hotel in Berlin, Germany probably does it the best. 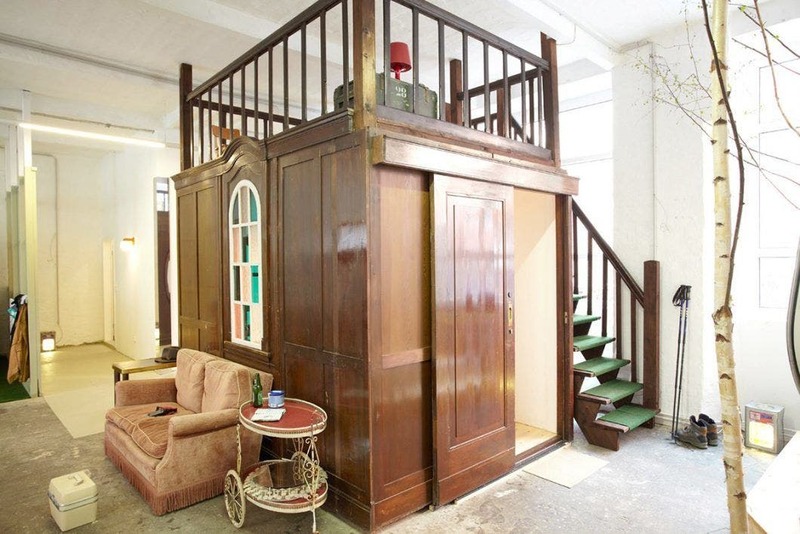 Hüttenpalast, which translates to “hut palace”, is built inside a nearly 6,500 square foot Berlin factory. It houses eight unique camping trailers, three artistic tiny houses, six regular hotel rooms, and shared bathrooms. 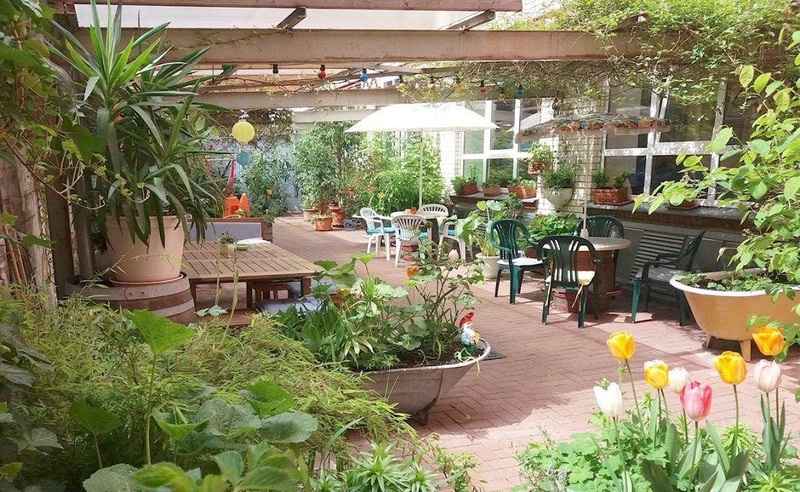 The hotel also includes a breakfast area, lounges, and a courtyard garden. Each of the houses and campers are available for overnight stays that range from 70 to 100 Euros per night. 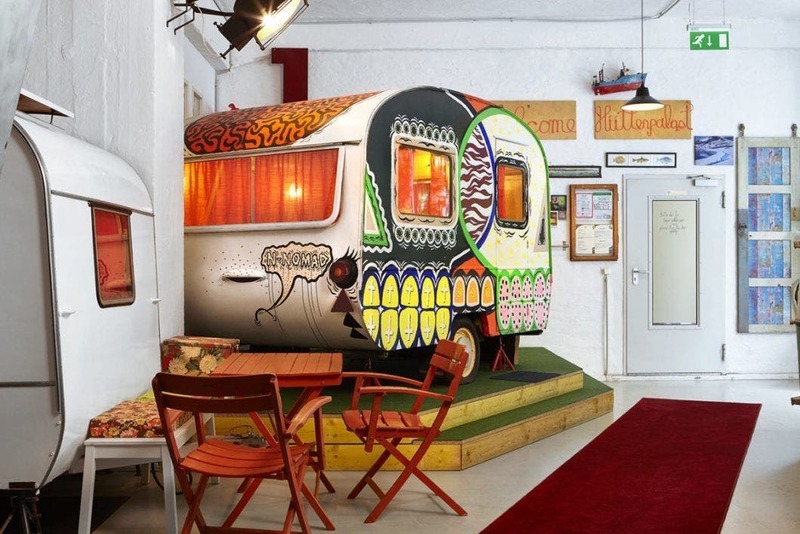 Hüttenpalast is a Berlin hotel where you can stay in unique campers or artistic tiny houses. 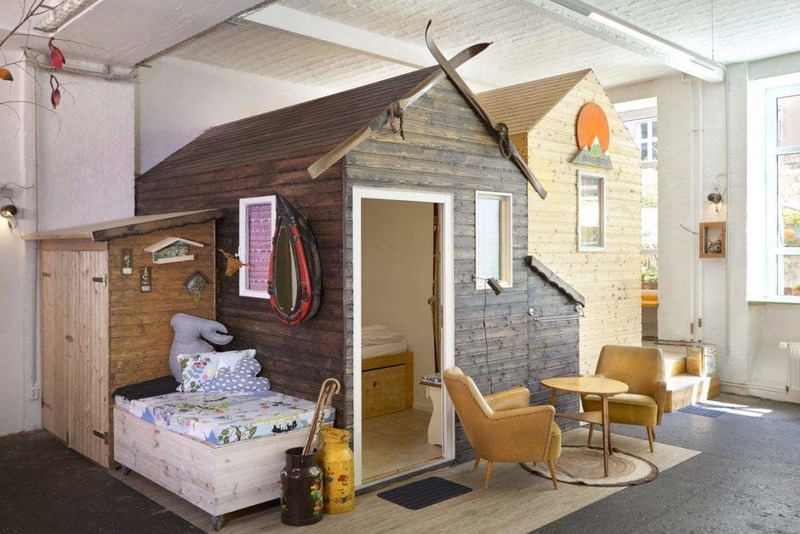 Each of the tiny homes were built using reclaimed materials. The interiors are designed by artists and feature unique details such stained glass windows on the Alter Palast house or wooden skis used as trim on the Berghütte . Each of the tiny homes (and the campers) can sleep two people and some of them have outdoor areas that extend the tiny living spaces. Of course, they are all protected from the elements under the factory roof and all feature lockable doors and privacy curtains. The Alter Palast is made from hundred years old panels that were part of the former factory. 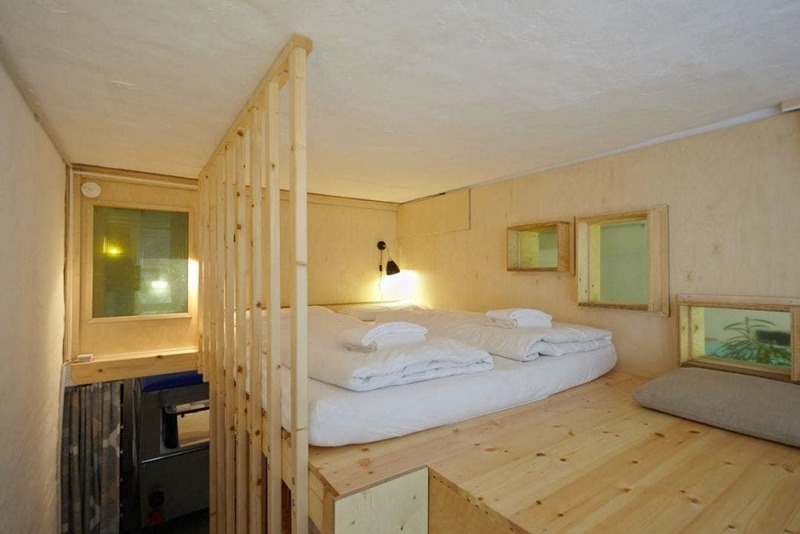 The Berghütte and the Talhütte can each sleep two people. 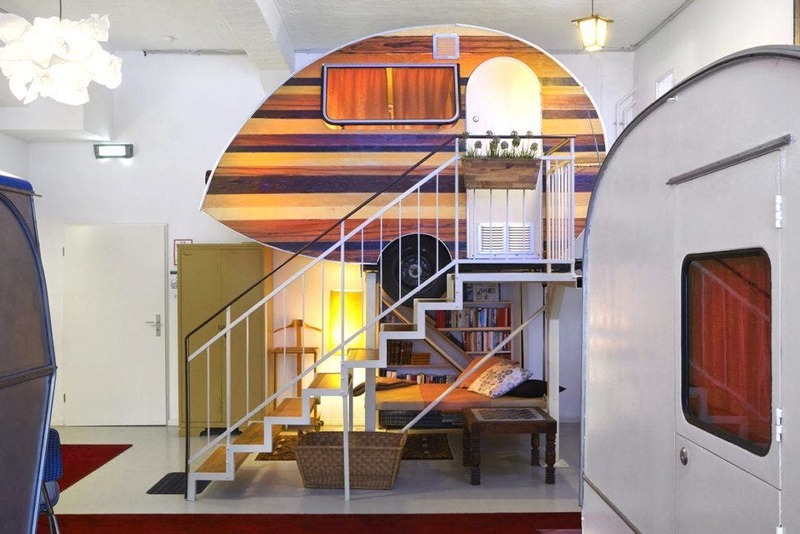 The Turtle might be the most unusual tiny house and has a lofted bed. 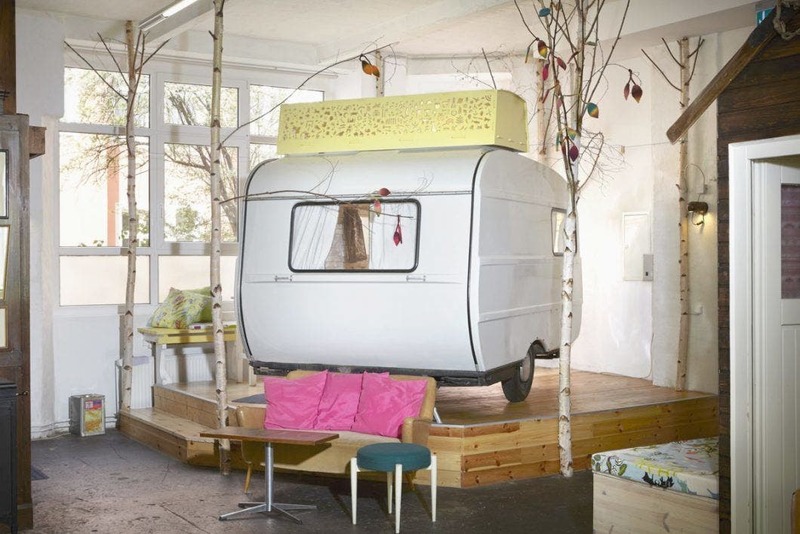 The Hüttenpalast’s various campers include some of Germany’s iconic tiny designs such as the Schwalbennest and the Eriba Puck . There is also a rare 1960s Friedel trailer with a popup roof and a Weferlinger Heimstolz trailer named Snow White. A QEK Junior trailer from the 1970s sits in the corner of the factory with views out the tall windows. 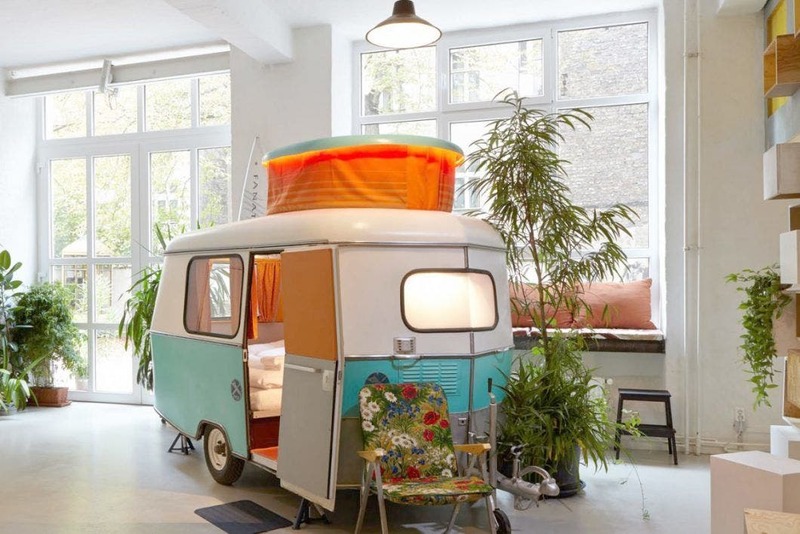 Named Kleine Schwester , or “little sister”, this camper has an open ceiling with a cap that contains a mural of stars, flowers, swimming horses, and music notes. The Kleine Schwester’s roof has a mural cutout featuring stars and music notes. …or inside a trailer that traveled through Africa. The “Dübener Ei” (egg) from the 1930s has its own lofty position in the hotel. 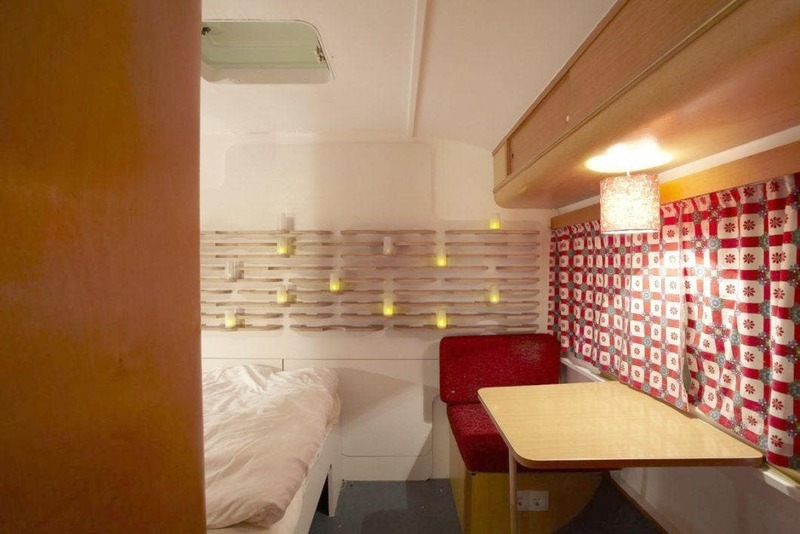 Each of the trailers can sleep two people. The idea for this hotel came from founders Sarah Vollmer and Silke Lorenzen. They wanted a hotel that veered away from the impersonal and staid block rooms that were typical of the neighborhood. 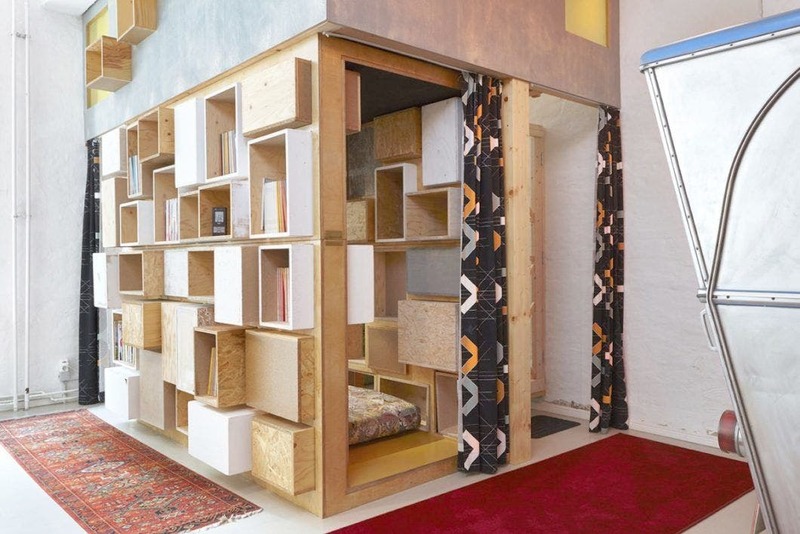 With no televisions and far from a typical hotel atmosphere, Hüttenpalast encourages community and artistic ideas. 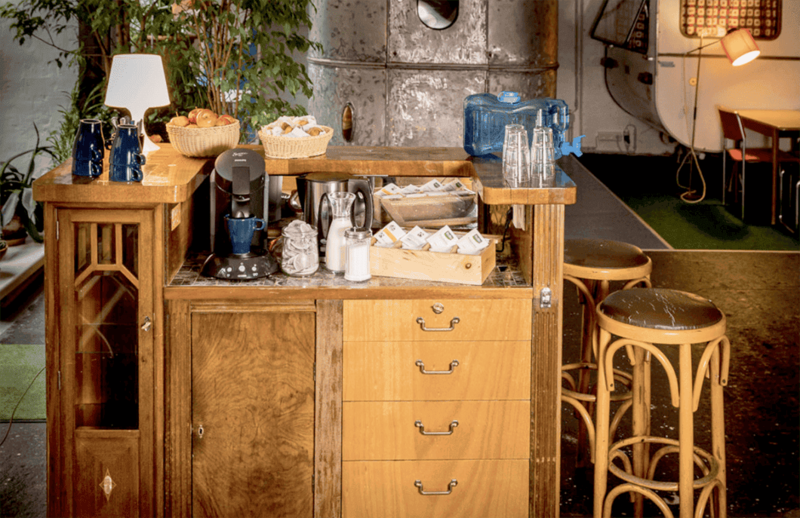 The hotel also includes a coffee bar and a garden courtyard.